As we come to the end of 2010, we present a special behind-the-scenes look at the making of Ate Up With Motor. Author’s note: Given the nature of this article, I’ve decided to temporarily set aside the sometimes cumbersome editorial we, and offer a first-person account of the process and philosophy involved in writing these articles. One of the first (and sometimes the most challenging) parts of writing an article for Ate Up With Motor is finding information. I hardly qualify as an automotive insider and, with rare exceptions, the articles that appear on this site are based entirely on publicly available information found in various print and/or online sources. All of those sources, public or otherwise, are detailed in the “Notes on Sources” section at the end of each article. First-person accounts of people actually involved in the design/development of the subject. Occasionally, these may come from direct e-mail, phone, or face-to-face communications with those individuals, if they’re still living and available; some industry people have very generously offered their recollections, feedback, and/or corrections, either before or after publication. More often, however, such accounts come from transcripts or excerpts of past interviews, such as the Automotive Design Oral History Project, conducted in the mid-eighties by Dave Crippen of the University of Michigan’s Benson Ford Research Center, or excerpts of interviews appearing in published books or articles. The more scholarly marque-specific histories. Some marque histories are essentially coffee-table books, with lovely photography and production design, but modest written content; others contain a wealth of minor details not easily found elsewhere. (For example, some include appendices detailing the company or division’s principal executives, along with the dates of their tenures.) In general, most really of the useful marque histories I’ve encountered have been print books, but there are occasionally some exceptionally thorough online sources that serve a similar function. Historical articles or books on the subject. There are many these, of highly variable quality and utility. The most valuable are generally ones that are based on interviews with designers, engineers, and executives involved in the development process, particularly if those individuals are now deceased. Contemporary reviews and articles. These may include vintage road tests (for general specifications, performance, and driving impressions), new model previews (which occasionally provide snippets of behind-the-scenes information), articles on specific new features or technologies, and manufacturer press releases and advertisements. I also sometimes consult popular magazines, newspapers, or non-automotive business journals, which seldom have much useful technical data, but may provide information on major business or legal developments — particularly for articles like the DeLorean Motor Company story, whose scope went well beyond the automotive sphere. Patents and other publicly available government documents. The full text of applicable patents are publicly available, as are both the full text and various summaries of automotive safety, emissions, and fuel economy standards. They aren’t necessarily easy or scintillating reading, but they are sometimes very handy for clarifying the details of complicated technical or regulatory issues. General automotive histories and other modern sources. These may include the less scholarly sort of marque history, fan websites, automotive encyclopedias, and the occasional non-automotive history texts. The broader the history, the less likely it is to have useful specific information, but general histories may provide additional context on events outside the automotive realm, such as the 1973 October War and the ensuing OPEC embargo. Inevitably missing from this list are the sort of corporate cultural references that would be intimately familiar to an insider, things like a company’s internal terminology and slang or the intricacies of the corporate org chart. Having gritted my teeth while reading “outsider” histories of other industries in which I’ve worked, I’m well aware of how off they can sometimes sound. It’s regrettable, but it’s difficult to avoid; even historians who’ve conducted dozens of interviews with employees of a particular company will sometimes stumble on unfamiliar names or concepts. The best I can offer is a preemptive apology to insiders who find that tone deafness grating. After compiling much of the information for an article, I will typically have anywhere from 12 to 50 pages of typewritten notes, which tend to expand further as I investigate questions that come up during the writing process. After that, I have to sort it into some intelligible form. I do a lot of the outlining in my head; I’ve never been particularly fond of formal outlines (which I find to be as much work as a rough draft, and markedly less useful), although I will sometimes create an annotated timeline for easier reference. Aside from sorting out the chronology (which can be very troublesome, given the lengthy and sometimes irregular lead times involved in automotive design), this process involves deciding how much weight to give the individual sources, particularly when they conflict. Even when dealing entirely with primary sources (e.g., first-person accounts by actual participants), those accounts are limited by what the participant knows or remembers — or what the interviewer thinks to ask. Occasionally, I’ve even found contradictory statements made by the same person at different times. While researching the Cadillac Seville article, for example, I found two quite different explanations of why the 1976 Seville didn’t have front-wheel drive, both of which were direct quotes from former Cadillac chief engineer Bob Templin, apparently from two separate interviews, years apart. Other problems may arise from errors in secondary sources. The fundamental problem with secondary sources (including my articles) is that they can only be as accurate as their own sources, and they often inherit the original source’s mistakes and shortcomings. Some are minor — someone simply wrote down the wrong date, misspelled someone’s name (or accidentally substituted one similar-sounding name for another), or made a typographical error — but they can elude the best editors and they sometimes become quite persistent; I’ve spoken before about the amazing number of sources that misspell the name of engineer Earle MacPherson, designer of the MacPherson strut. Sometimes, a piece of information is obviously wrong, particularly if it contradicts other reasonably reliable sources. To confirm the spelling of MacPherson’s name, for instance, I was able to look up some of his patents, which included scans of the actual applications and MacPherson’s original signature. In other cases, the problems are not as easy to recognize. All I can do is consider the weight of the evidence and either make my best judgment or present both versions and leave it up to the reader to decide. Whenever I can, I try to gather detail shots that might be useful in either existing or future articles. 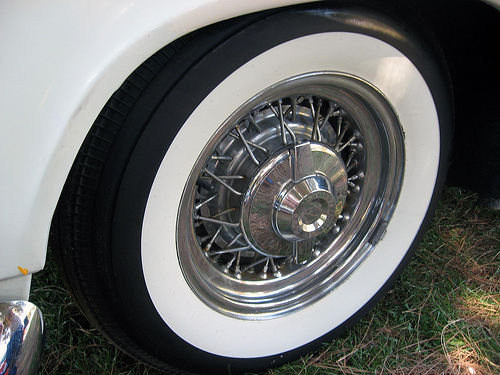 This is a Kelsey-Hayes wire wheel on a 1955 Chrysler C-300, a car I’m hoping to give a suitable write-up in 2011. The next step is to form a thesis or a through-line, which leads us to the always-sticky issue of subjectivity and personal opinion. No matter how much research or evidence you have, any narrative is ultimately a combination of individual perspective, interpolation (if a and c, then b), inference (if a and b, then c), and supposition. This is not to say a narrative history can’t be inaccurate if it’s based on faulty premises or quantitative factual errors, such as incorrect dates. The point is that even in the best-case scenario, it will only ever be one person’s interpretation of the available data. I firmly believe that the entire purpose of history is to interpret facts: to draw conclusions about why things happened, why people made the choices they did, and why understanding those things is important in the present. If you made a list of only the quantifiable facts about a past event, you would have an almanac, not a history — and even then, you’d inevitably have ferocious arguments about the accuracy of measuring devices and calendar systems. I’ve been criticized by a number of readers for not pointing out that the content of the articles is simply my interpretation of events. I would argue that that subjectivity is implicit in any history text. If you pick up an intimate biography of Alexander the Great by a noted historian, the author is unlikely to begin each new paragraph, “I believe, based on the evidence I’ve gathered…” unless he or she is either presenting a new or controversial finding to which s/he wants to call attention, or is preparing to enter into a rhetorical argument with other writers and academics. In general, if I qualify my statements, it usually implies that (1) I’m presenting someone else’s thought, with which I don’t necessarily agree (or that I don’t have any way to evaluate) or (2) I’m either on the fence about something or feel that my information is too sketchy to support anything more than a tentative theory. I’m well aware that some readers will disagree with my conclusions, which is certainly their prerogative. If you find the presentation of subjective interpretations inherently offensive, though, or dislike reading anything with which you don’t wholly agree, I can only suggest that you’d be happier elsewhere. 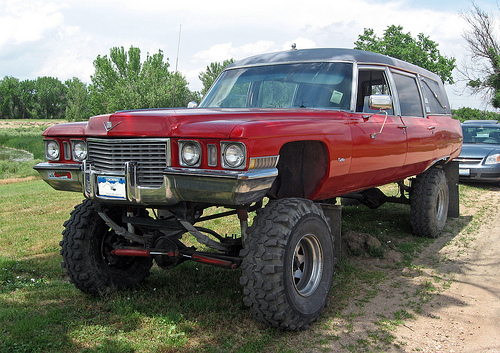 Is this bizarre, Cadillac-based monster truck creative and unique, or just plain wrong? You be the judge. Once the article text is done, I go through it a few times to see if it reads smoothly and look for typographical and grammatical errors. (Inevitably, some slip through, which is a source of great frustration. I don’t have a proofreading staff and it’s very, very difficult to reliably proof your own work until some time has elapsed.) I then compile the sources into a list to build the “Notes on Sources” section. After that, I load the content into the CMS, set up the formatting and internal linking, and start placing the illustrations. Sometimes I write the image captions along with the rest of the text, adding placeholders to indicate where each illustration will go; other times, I write the captions after the rest of the text has been set up. The whole “paste-up” process is quite involved and usually takes at least two or three hours. Finding suitable illustrations is an ongoing challenge. I am generally reluctant to start an article if I don’t have at least some of the images I’ll need (or at least know where I can get them), and my choice of subjects is often dictated by my supply of photos. While I do sometimes use images from elsewhere (either ones that the authors/owners have given me permission to use, or public domain or Creative Commons images), I strongly prefer to use my own, even if they’re not the best. It’s partially a question of time (locating and securing permission to use a lot of images can take days or weeks) and partially because my standard terms for licensing someone’s image allows them to rescind that license at any time. Since I’m not in a financial position to buy images outright, I consider that only fair, but it means the risk of having to replace a bunch of images on short notice. Therefore, an okay image that I actually own is often preferable to a gorgeous one I do not for purely practical reasons. It will be immediately obvious that I’m neither a professional photographer nor a technical illustrator. All I can hope is that my photos are serviceable and the diagrams not comically inept. 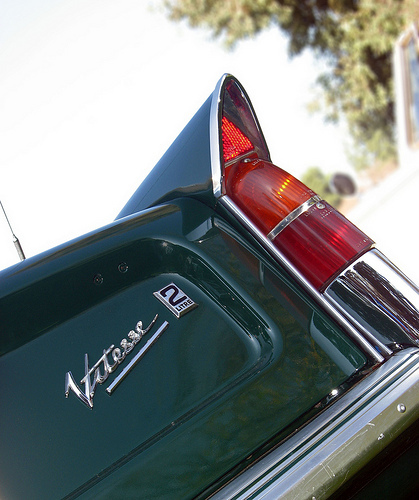 A rare attempt at aesthetic flair: the stubby tailfin of a 1968 Triumph Vitesse 2 Litre convertible. As is probably clear by this point, I put a lot of work into each of these articles, both in research and writing. Nonetheless, I make mistakes. My information is neither limitless nor infallible; there’s some data that I simply don’t have any reliable way of finding and potentially useful sources of which I was either unaware or couldn’t get prior to writing. Sometimes I miss some critical point in the sources I do have, accidentally transpose specifications, or come to a conclusion that turns out to be wrong. Not even the most well-established and respected authors and publishers are immune to error; that’s why newspapers print errata. While I am obliged to point out the “No Warranty” provision of the Terms & Conditions, I take errors very seriously and if I become aware of a mistake, I take pains to fix it to the best of my ability. One of the great luxuries of the web format is that it makes it possible to go back and make corrections with far less hassle than reissuing a printed book or magazine. I make changes to these articles all the time, either in response to comments or because I’ve found a new source of information. Occasionally, days or weeks after the fact, I’ll be walking to the grocery store or making dinner when I suddenly remember some point I’d forgotten. Whenever I find a related book or article I hadn’t previously read, I usually go through it to see if its information jibes with my existing sources or if it clarifies any points of which I’d been unsure. For example, I recently persuaded the public library to let me check out a reference book containing interviews with a number of American automotive designers, including Frank Hershey. I had previously found some conflicting or questionable information on his career (such as exactly when joined Ford), which I was able to clarify based on Hershey’s recollections. I made a number of amendments and added the book to the sources for each article. I don’t necessarily announce those sorts of minor revisions, unless it’s something significant — do you really want to know every time I fix a minor grammatical error? — but they happen constantly. If someone points out a potential error or questions my premises, my first response is to recheck my notes to see if I’ve simply garbled something — scrambled a date, dropped a digit, confused one trim series for another. If that’s the case, I’ll just correct the mistake immediately. If I can’t verify the point that way, I will generally ask the commentator for their source(s), if they haven’t already made that clear. To paraphrase Charles Kettering, GM’s first research VP, one of us may be wrong, but it’s important to figure out whom. In general, if you can present credible evidence (whether from other written sources or from personal experience) that I’m wrong, I’ll revise the text accordingly. If you have a logical argument for why my conclusions are faulty, I may decide you’re right. On the other hand, if you cite a source that I’ve examined and decided was most likely off base, I’ll say so; this is why I list my sources. And if it’s solely a question of opinion — if I think X is beautiful and you find it hideous, or vice versa — we’ll have to agree to disagree. I have no illusions about satisfying all of the people all of the time. 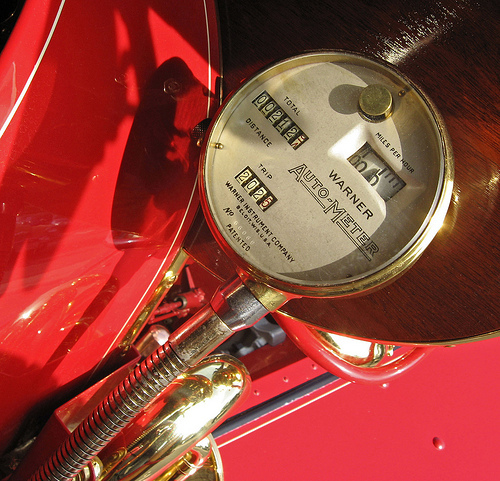 More details: a Warner “Auto-Meter” speedometer/odometer on a 1910 Packard Model 30 Gentleman’s Runabout. Insert your own EPA mileage joke. As longtime readers will have noticed, my more recent articles are frequently longer and more extensively researched than ones written earlier. From time to time, I will reevaluate an older article and decide that it merits a complete revamp and expansion. Most of the revamped articles are what Hollywood describes as a page-one rewrite; by the time I’m done, little generally survives of the original except for the title and a few images. (In many cases, the title survives simply so that existing links to that article won’t break, which is a big technical hassle.) The major revisions are rarely prompted by any specific feedback; they tend to be driven more by my personal standards for what each of these articles should be. There is not, nor will there ever be, a perfect history text, automotive or otherwise. If there were, I’d just buy it for my own reference rather than trying to write these articles. There will never be a critic with whom you always agree; the question is whether you find their observations interesting or useful. If not, look at the sources, find new ones, and draw your own conclusions. That’s what I’ve done, and I invite each of you to do the same. In closing, I’d like to offer my thanks to everyone who’s tuned in for new articles, the photographers who’ve allowed me to use their images, and the industry folks who have taken the time to offer their thoughts and feedback. Ate Up With Motor is a commercial enterprise — albeit not a hugely lucrative one — but it’s the response from readers that makes it worthwhile. I hope to see you here again in 2011. Just wanted to say how much I appreciate this site. Your research, narration and illustrations are first rate and provide lots of information and entertainment. Although I may disagree with some of your opinions (I’m president of the Lincoln & Continental Owners Club! ), your presentations are fact based and always supportable. Please keep up the good work and have a great holiday…you’ve earned it! I love your site. As a car nut as well as a history buff I have read almost every article on your site, even ones for vehicles I don’t like. It is great that you try to stick to facts and will admit when there is an error and modify it. God bless you in the foloowing year and I look forward to new articles to increase my knowledge to the subject I love. One of my favorite aspects of this site is the photography. The use of daily drivers (and the occasional beater) to illustrate many of your articles works well with the whole concept that a car doesn’t have to have twelve cylinders and a Pininfarina body to be interesting. You’re a good interesting writer even though my pet peeve is The Royal We but even with that, it seems you chose that on a reasoned response. That is a very minor detail indeed. Keep up the good work! Aaron, contact me offline… you mentioned needing a proofreader, I may know someone (a fellow automotive history buff) who would volunteer. The problem is that I’m not in a position to be able to hire somebody, but if you want to talk further about it, send me a note through the comment form. I never realized how much I looked forward to what was usually a new weekly story, until things got a bit thin this fall! I understand this was related to some personal issues (hopefully not serious! ), but “we” missed you all the same. One question… the Ate Up With Motor site has become REALLY slow of late. Generally now it takes about 30 to 60 seconds to load a page. Any idea what this is about? But that is a minor problem… glad you’re back! Unfortunately, even in the best of circumstances, the speed is not great. The Ate Up With Motor site is resource-intensive (more than I’d like, really), and it runs on a shared server. As my host has explained it to me, the lag results from the site momentarily exceeding its resource allotment. Short of a complete redesign of the site (which I don’t really have time to do) or switching to a dedicated server (which I can’t currently afford), at least some periodic lag is hard to avoid. The cache helps by limiting the number of server calls, but it only does so much. Not really much worse than the original vehicle! I’m reminded of a short story (whose title escapes me) that I read quite a few years ago. A man is confronting another man who’s been fooling with his wife, and the other man says, “One more slice off a cut loaf, if you don’t mind my saying so.” Same principle. Now, if they’d done this to, say, a Lancia Aurelia, I’d be upset! Thanks for running a great website, and Happy New Year! As a lifetime car-buff, I’ve gotten hours of pleasure from your site’s combination of technical depth, cultural history, and sheer detail. It gratifies my childhood fondness for GM land-barges of the 60s, but it has taught me about all vehicles and technologies that I would never have thought myself interested in. Thanks. As someone who teaches writing and trains future academics in literary studies, I can only say that your description of research methodology and writing process are exactly what I aim to get my students to do. Naturally, we aren’t perfect, and errors creap in. They can be corrected when we find them. When they sneak through anyway, we must be content with having done our best. As for subjective “opinion,” it is, as you say, impossible to avoid. More than that, it’s undesirable to avoid, even as we try to guard against our own biasas. No two people will agree on everything, because everyone sees an object from a different perspective. And our own perspectives change too. (“But professor, last fall you said….”) The inevitability of subjective perspectives in history and criticism is what makes someone else’s angle on a subject worth listening to. Your work and your skill have made your views those of an [i][/i]informed[i][/i] researcher and writer. And your prose is a pleasure to read. The next time I’m teaching undergrads what research is like and how to understand what it involves, I’m going to use your article. I just wanted to leave you a comment thanking you for all the hard work you put into these articles. I know that it is probably frustrating sometimes considering the “too long; didn’t read” attitude of many on the web. However, never forget that there are a few of us out here that are willing to take the little bit of time it takes to read one of your articles. The only thing that irks me about subjectivity when presenting classic cars is that they’re often viewed through a modern lens. Tastes are what they are, but for a thorough historical perspective I’d like to know if the car was good “for its time”. I’ve made an effort throughout the site to consider just that, although obviously I’m not going to be able to have the same perspective on a car built before I was born as someone who was there at the time. One of my favorite articles was an old (1980s) magazine. Probably “Road & Track” where they compared sports cars of the past to a K-car. The K-car was better than most. I’m sure the cheapest of Kia’s they sell in the US would be even better. I think in the heat of the moment many of us dismiss the late model cars and trucks we see every day and pine for a rosier past. A person from 1950 brought forward to 2011 would be gobsmacked by the level of technology, safety, and reliability (manifested in large part from driveability) in modern vehicles. I think for the most part people are responding to the styling of older cars, rather than their performance or technology. What I don’t think people necessarily recognize (or care about) is that in their own time, a lot of cars were just as bland and orthodox as modern cars appear today. There are exceptions, like the much-mocked coming-or-going Studebakers or the boat-tail Rivieras, but there were a lot of middle-of-the-road, ordinary cars; they stand out now because they’re removed from their original context. The same goes for paint colors. While there were outrageous two-tones and Big Bad colors, they were generally the exception. A lot of sixties buyers (in the States) just went for white or a number of pale metallic shades (gold, bronze, light green, beige, etc.). It’s true that two-tones have died out, but given the changes in exterior shape, it may be just as well — the two-tone combinations offered on late-seventies and eighties cars were generally pretty aesthetically unfortunate. I am blessed to own two vehicles that have marvelous paint schemes, and they’re not particularly old or “classic” by any stretch. 1996 Sierra in a gorgeous bright blue and white two-tone (blue interior), and a 1992 Crown Vic in tri-coat medium amethyst (basically medium blue but lighter or darker depending on the light), with a cream coloured interior. I don’t think I have any choice but to keep them, seeing what’s on tap these days. “Steel grey” is the absolute worst; why would anyone want that? I also hope mfgrs. will introduce more brightwork (can’t call it chrome when it isn’t chromium covered steel – are 1/2 ton bumpers even chromium anymore?). I don’t think modern styling has to necessarily mean monochromatic – look at how mfgrs. compensate by putting on 18-20 inch chrome wheels on an otherwise bland sedan. Your writing is always a most respectable take on a subject that suffers from really superficial and juvenile commentary in a lot of other places. Need a proofreader? Personally I don’t think you do but the article indicates you think you do. …For the Christmas present! I’ve been checking in regularly for new articles, having hoovered up existing ones obsessively. I’ve said it before, but I’ll say it again – it’s a travesty that you don’t have a book out. I may be suggesting the obvious, but have you looked at popular science / mechanics on Google Books? Every issue is there, searchable, and they’re fascinating snapshots in time: not only can you see opinions on automotive beauty, but horrifying ones on architectural beauty. One particularly depressing example from the ’50s was from an article showing a ‘before’ photo of a gorgeous bungalow, with two big porches, slanting columns, and tons of detail in woodwork, framing, and gables. The article asked, "Is this outdated bungalow worth saving?" – and then proudly presented the results: a perfectly flat, two story box, white clapbord, shorn of any protrusion or shred of character. Its paramount achievement? A huge picture window, can-openered randomly into the side of the house that formerly had a large porch. The context of the time is quite as interesting as the cars – even the ones, as PM often mentions, "that a woman finds easy to drive". I have indeed mined the [i]Popular Science[/i] and [i]Popular Mechanics[/i] archives on Google Books. I wish more magazines would do that — it’s becoming hard to find back issues of periodicals older than six months even at the library, and even then, you can’t do Boolean searches. What I really wish were available were the back issues of [i]Automotive Industry[/i], a trade publication that started in 1895. The [i]AI[/i] website implies that their back issues are all indexed online, but only by subscription, which is a wince-inducing $330 a year. Your photos are very serviceable. To those of us foreigners unfamiliar with a lot of American made cars, they are invaluable in telling your stories. I’ve recently started my own personal car blog (shameless plug alert: http://themagicboltbox.wordpress.com/) and I can wholeheartedly relate to the difficulties you encounter. I have a graduate degree in history and am a lifelong car guy, so this site is obviously right up my alley. I’ve voraciously read every article, some twice, and I have to say this site is the foremost automotive history site on the internet. I’m jealous of the quality of work you do, keep it up! Ate Up with Motor is quite possibly my favorite auto related website, I’ve read nearly every article you have, and I’ve been impressed by the quality of your writing and research. Such quality content is a rare find on the internet, especially it seems (and sadly) in the car world. I am a photographer as well as car enthusiast and would love to contribute some images, but I don’t think I have a large enough library to be of much use. Thanks so much for all your hard work, this site is a joy and I’ve recommended it to a number of friends and have even referenced your work in conversation with non-auto enthusiast friends. Thanks and happy new year.